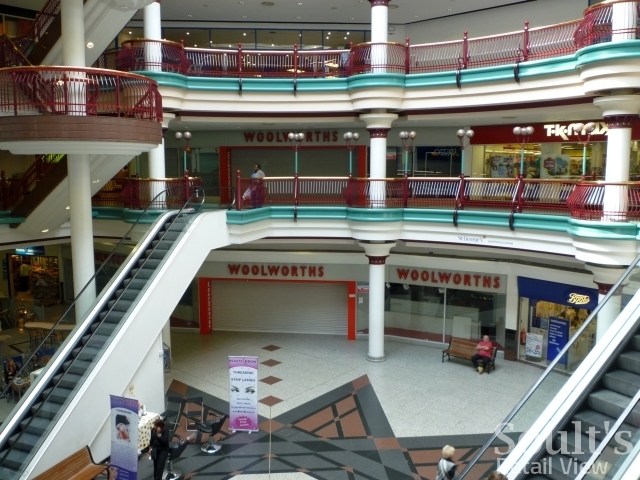 Having arrived at King’s Cross, first stop was the St George’s Centre in Harrow, where the large, two-storey former Woolies (store #1198) is still empty. However, Peacocks and Sports Direct are reported to be moving into some of the space, while TK Maxx apparently plans to extend its existing store. 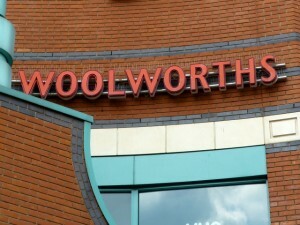 The supposed presence of Woolworths is still announced on the outside of the shopping centre. 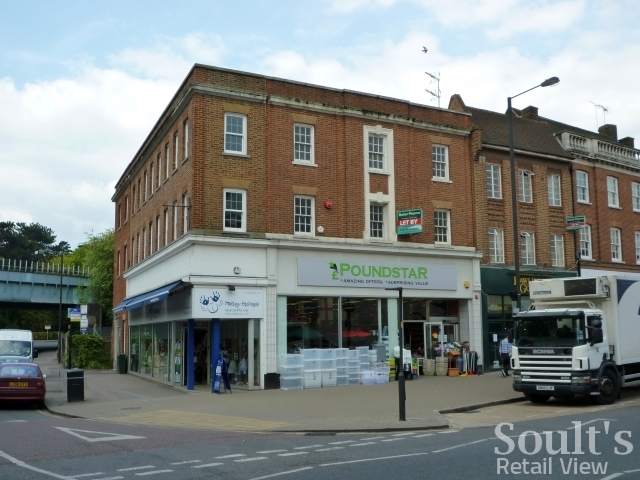 A little further along the Metropolitan line, the old Woolies in the attractive suburb of Pinner (store #706) – seen here in its former guise – is now a Poundstar discount store. It opened as a Woolworths on 8 October 1937, and closed following the chain’s 2008 collapse. Having travelled to the end of the line at Amersham, there was time on the return journey to pay a visit to the old Woolworths in Edgware Road (store #2031). 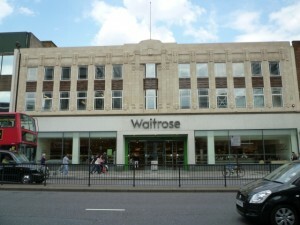 In June 2008, just a few months prior to Woolies’ collapse into administration, the 21,000 sq ft Edgware Road store was one of four Woolworths stores in London to be acquired by Waitrose. 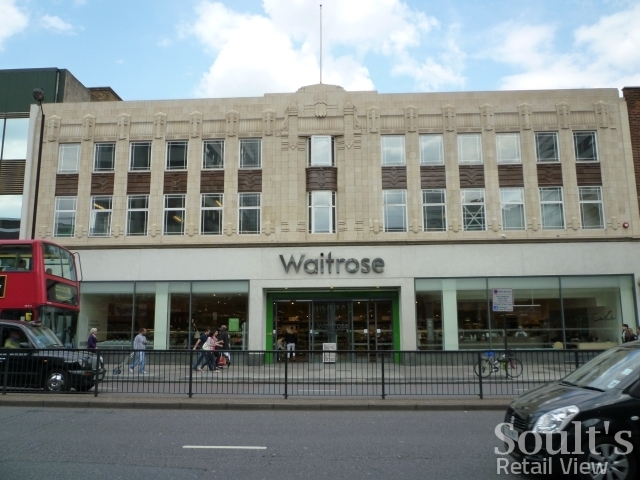 According to the Woolworths nostalgia site 100thBirthday.co.uk, a Woolworths store first opened on the Edgware Road site on 21 March 1914, with an extension built in 1936. 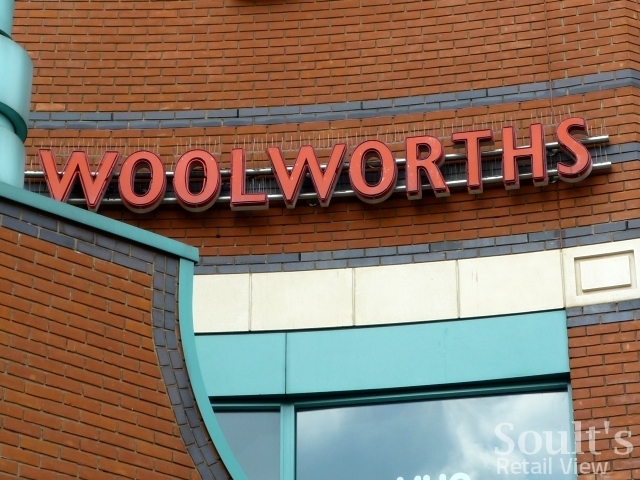 In 2000, it became one of the first pilot stores for the short-lived Woolworths General Store format, which apparently accounts for its renumbering to store number 2031 (for an explanation of Woolworths store numbers, check out this post from a couple of days ago). Next stop was a store, at 120/122 Brentford High Street (store #829) that bears no architectural clues of ever being a Woolworths; indeed, I only knew it ever existed by speculatively Googling ‘Brentford Woolworths’ in advance of my stay in the suburb’s Premier Inn, and happening upon a postcard image of the store from the 1950s. 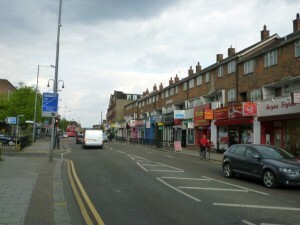 The ‘F W Woolworth’ fascia can be seen to the right of the picture, in the (then) modern County Parade. The store must have been fairly new when the photo was taken, given that it only opened in March 1954. 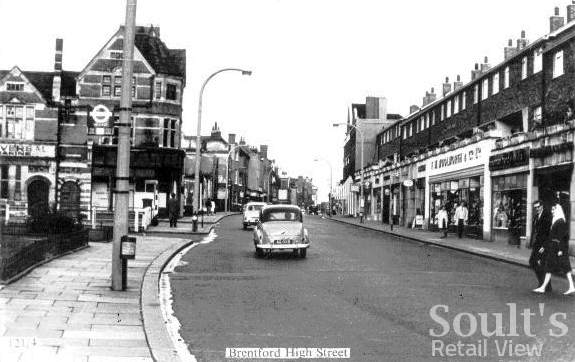 Sadly, Woolworths’ presence on Brentford High Street was fairly brief, on the scale of things; 100thBirthday.co.uk reports that “the store did not prosper in the 1960s and was among the first stores to be closed on economic grounds during a review in 1974”. Here’s a similar view today – by comparing the details of the two shots, and the street numbers, it looks like Woolworths would have been where the Vanity Lounge, Ouch Tattoo & Piercing and Law for All units are today. 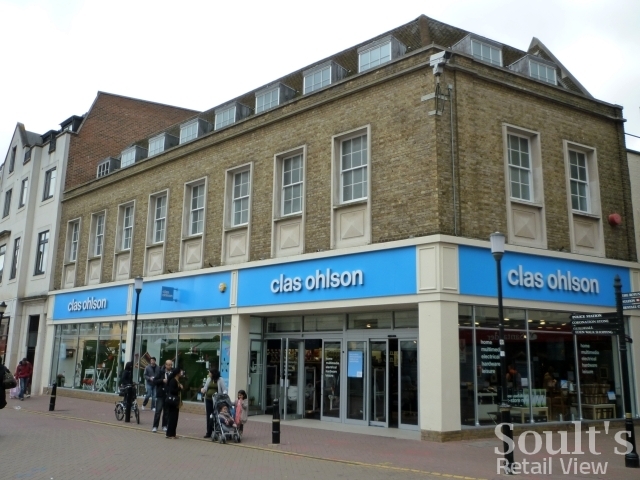 Last but not least, it wouldn’t have been possible to visit London without checking out one of the former Woolworths that’s now a Clas Ohlson. 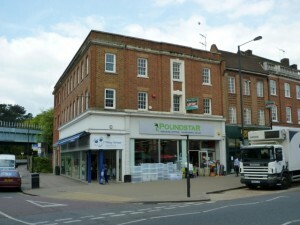 Step forward Kingston-upon-Thames (store #43), where Woolworths occupied the Market Street site from 5 May 1931 until the firm’s collapse 18 months ago. Having repeatedly called for Clas Ohlson to come to Newcastle, I’m pleased to say that the actual store experience lived up to my expectations. 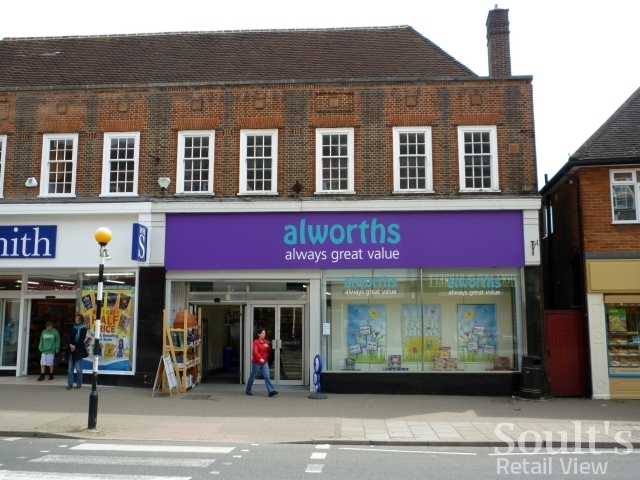 The unit has been comprehensively refitted to remove any sense that it was ever a Woolworths – the opposite, it must be said, of Alworths in Amersham – creating an interior that is cool, modern, and attractively lit. In terms of product range, the store is the eclectic mix of “modern hardware” that Clas Ohlson seems to have made its own – perhaps not so much a “chic Woolworths” as a hybrid of Robert Dyas, Maplin and Lakeland, with an inevitable Ikea-esque whiff of Sweden in the store’s look and feel. I’d certainly look forward to paying another, longer visit to Clas Ohlson, though the distance to Kingston means that the recently-opened Leeds or Liverpool stores may be more likely targets. 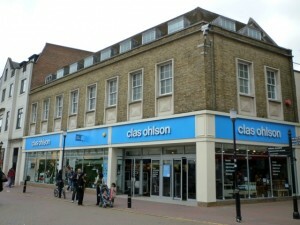 However, give the press release from yesterday which states that “Clas Ohlson plans… 17-22 new stores during the 2010/2011 financial year, of which 6-10 in the UK”, perhaps that longed-for Newcastle branch will yet be forthcoming. The Pinner Woolworths (that was a pound store in your photo) is now a WHSmith! If you look at the film called Metroland (by John Betjeman), there is a section devoted to Neasden which shows Neasden Parade, followed by a view along Neasden Lane. In that second view you can see a branch of Woolworths which is now a pub called the Misty Moon. I worked in Baker Street in the mid 1970’s and I am pretty sure that there was at that time a branch in Marylebone High Street. There was also the huge branch at Victoria on Wilton Road – I used to get my lunch there when I was on day release at Westminster College.